Home » Health » What Is Alkaptonuria? Alkaptonuria is a rare disorder experienced by a person during homogentisic acid buildup in the body. As a result, the urine or some parts of the body look dark or black over time causing a number of health problems. Alkaptonuria is a genetic disorder inherited from parents. The symptoms of this disease are often neglected at first and only seen after the sufferer reaches the age of late 20s or early 30s. This happens because the buildup of homogentisic acid occurs slowly. As a result of the accumulation of these substances, cartilage, tendon, bone, nails, or ears become dark or blackish. Patients with alkaptonuria can still live normally, although the quality of life can be disrupted due to pain problems in the joints or disorders of the heart's organs. Symptoms of the nails and skin , a change in the color of sweat, nails turn into blue, and skin color that changes mainly on the forehead, cheeks, armpits, and genital area. 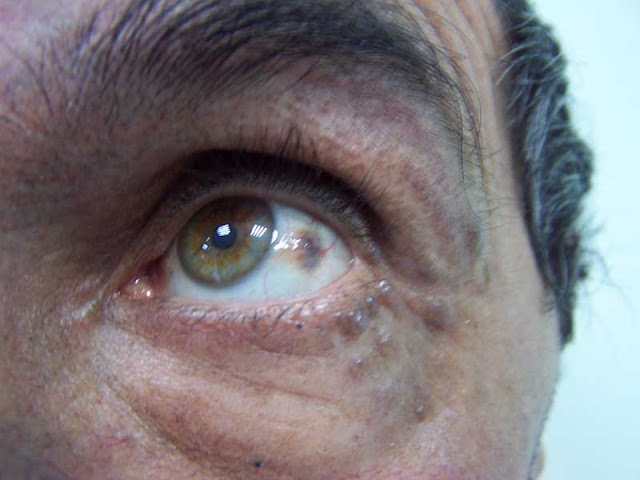 Symptoms on the eyes , a brown or gray stain on the whites of the eyes. Symptoms of the ear , in the form of cartilage of the ear to be blackish black (ochronosis), and earwax into black or reddish brown. Early symptoms of osteoarthritis , such as pain or stiffness in the joints and spine, shoulders, pelvis, or knees. These symptoms generally begin to appear since the age of 20 or 30 years. Other symptoms , such as shortness of breath or difficulty breathing, blood vessels become stiff and weakened, valvular heart disease and the formation of kidney stones , prostate, or bladder. Under normal circumstances, the body will break down two protein-forming compounds (amino acids), namely tyrosine and phenylalanine through a series of chemical reactions. But under alkaptonuria conditions, the body can not produce enough homogentisate oxidase enzymes. The enzyme is needed to break down the metabolic yield of tyrosine in the form of homogentisic acid . As a result, homogentisic acid accumulates and then becomes a black or dark pigment in the body, while others are excreted through the urine. The inability of the body to produce homogentisate oxidase enzyme is caused by the mutation in the enzyme-producing gene, the homogentisate 1,2-dioxygenase (HGD) gene. The disorder is derived autosomally recessively, which means that the mutation of the gene should be inherited from both new parents causing this abnormality, not just one. Diagnosis of alkaptonuria can be done if a person is suspected of experiencing symptoms of this disease, such as urine is dark brown or black if exposed to air. To be sure, the doctor can perform a urine examination, especially to see the presence of homogentisic acid in the urine. In addition, DNA tests are also done to see if there is a mutation of the HGD gene in the body. Handling action is imperative when a person is diagnosed with alkaptonuria. If this condition is detected as a child, action can be done is to slow the rate of disease by applying a diet low in protein to reduce levels of tyrosine and phenylalanine in the body. In addition, doctors will also recommend giving vitamin C to slow the buildup of homogentic acid in bone and cartilage. Another handling that can be done is by giving drugs called nitis inone . Although until now there is no drug that specifically can overcome alkaptonuria, nitisinone can be given to lower levels of homogentisic acid in the body. Nitininone is an enzyme inhibitor that forms homogentic acid. Taking painkillers and anti - inflammatory drugs to treat joint pain. Undergoing Physiotherapy is done with the help of a tool called transcutaneous electrical nerve stimulation ( TENS ) to make spinal cord ends to numbness so that the pain subsided. Perform regular exercise regularly. Patients with alkaptonuria often experience pain in joints or joints feel stiff. In order to inhibit the severity and to help strengthen the muscles and joints, the patient needs to do mild exercise, such as swimming regularly. Other mild exercises, such as yoga and pilates can also be performed. It is advisable to avoid strenuous sports and vulnerable to physical contact, such as football or boxing, to prevent injury to joints. Emotional support. Patients with alkaptonuria may experience anxiety or depression due to disrupted health conditions throughout life. Therefore, emotional support is needed for patients and their families to be able to live it. If alkaptonuria causes damage to joints or other organs, surgery may be recommended. This procedure is performed on half the cases of alkaptonuria sufferers over the age of 50 or 60 years. The type of surgery usually performed on the joint is a hip or knee replacement surgery. While the type of surgery in the heart organ that is generally done when the heart valve hardens is a heart valve replacement surgery. 0 Response to "What Is Alkaptonuria?"